(1) One day cruise to Hydra-Poros-Aegina - Explore the Greece you know - Discover the Greece you don't. Let a local tour expert organize your tours and make your dream come true. Locals know better. This is your opportunity to explore 3 beautiful islands – Hydra, Poros, Aegina. DO NOT miss it!!! Join us, and enjoy a popular cruise, delicious food, live entertainment with Greek music, popular Greek songs, and Greek dancing in fully air-conditioned cruise ships. The brochure price for the cruise & lunch is 99.00 euro. The transfer to/from the pier costs 10.00 euro extra. Combine it with a guided tour and get a good package deal. Pay the brochure price (min. 2 pax) and get a free airport transfer, or, (all clients) pay 142.00 euro and combine it with a 1-day tour to Delphi (no lunch), or, pay 149.00 euro and combine it with a 1-day to Argolis (no lunch). The boat sails from marina Falirou. At 06.50am, the pick-up service starts from hotels in the centre of Athens. After departure, the hostesses will familiarize you with the islands that you will visit. The order in which you will visit the islands may change but this does not affect the time of stay on the islands. Each of the picturesque islands has its own charming and distinct atmosphere. There will be plenty of time for exploration, at your own pace. is the smallest of the three islands. A green island, with a plentiful supply of fresh water, sandy beaches, and a famous lemon forest. Your time on Poros, almost 50 minutes, is just enough for a short walk to the highest point for a nice view from the clock tower. 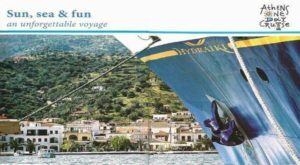 Sailing to Hydra, you may relax in the lounge or enjoy the sun on the ship’s decks. is your next stop in an hour and 20 minutes, later. It is the island favoured by artists worldwide, has narrow, whitewashed streets, and exquisite mansions. The architecture of the island is striking. The stone mansions have a long history, while the stone-paved streets are waiting to be explored on foot or on the saddled donkeys that are waiting to be hired. Hydra island is world famous. You will have one hour and 45 min. to enjoy the charms of the island and upon your return on the boat the tables will be ready for your lunch. After your meal, the orchestra, the singers, and the dancers will invite you to join them and dance to well known Greek songs. is the last, but largest of the 3 islands. Aegina is known for its neoclassical buildings, its busy harbour, and its pistachio nuts. The harbour with the old mansions invites you to explore the island further: An optional Tour is organized to visit the Aphaia Temple. The well preserved temple in Greece is one of the 3 temples in the “Sacred Triangle” of the Greek antiquity. Your tour guide will tell you the story of the site and there after the tour proceeds to the Byzantine Church of St Nektarios. Tickets for the above recommended optional excursions can be purchased on board the ship. An alternative choice is to stay by the port of Aegina and enjoy a walk or horse-carriage ride around the town or relax in one of the harbour’s coffee shops. Get on board the ship at 07:50 and depart at 08:00. The order that you will visit the islands may change but the time of stay on the islands will be the same. Islands of Hydra, Poros, Aegina, Temple of Aphaea and the St. Nektarios monastery, delicious food, live entertainment and Greek folk dancing show. There is a cancellation deadline if the bookings are not pid on time. Press on the INSTANT confirmation link 48hrs before departure, make the booking and get the confirmation in a minute. The optional Aphaea tour is sold on board only, from the ship’s excursion desk. The temple of Aphaea is in very good condition. The location together with the Acropolis of Athens and the Temple of Poseidon at Cape Sounion, form a “Sacred Triangle” between North, East, and South. – Drinks and the optional tours in Aegina are not included, and are paid on board. Click and SEND US your booking request and we shall get back to you asap. Combine the cruise with a guided tour or airport transfer and win, call us for more details.